I am always happy to review products or host product giveaways. If you would like me to do a review or giveaway please contact me and we can work out the details. I will review the product in a timely manner and let you know when the review will be posted. Here is a little bit of information about me to help you determine if your product or campaign is a fit for this blog. 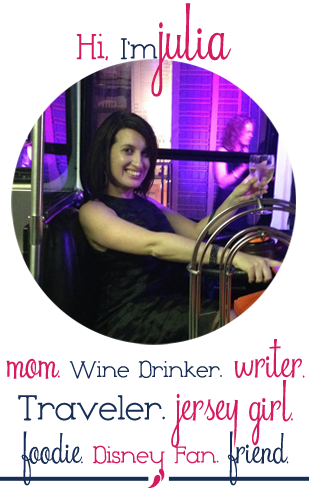 I’m Julia and I started Wine In Mom as a way to document my experiences as a first time mom. When readers visit Wine In Mom I hope they feel like they are having a glass of wine with a friend, sometimes I share the good stuff, sometimes I whine about the kids, sometimes I share products I love. I value having an intimate group of readers who I am able to respond to on a daily basis. I’m a mom, wife, dog lover and a Jersey girl. I live in South Jersey which means Atlantic / Cape May County area. I am closer to Philly than New York but really close to Atlantic City. I have 2 kids a son (2010) and a daughter (2016). If you have a product or PR campaign that is geared towards their ages I would love to hear more about it. I am always interested in products that are a great fit for my kids. Family fun travel experiences are also a great fit. My husband and I are always interested in the opportunity to share food and wine related products and events. I have attended Disney Social Media Moms On the Road and Disney Social Media Moms Celebration. I have previously worked as a freelance writer for Jersey Family Fun, reviewing toys and family friendly travel destinations. I was named a Trekaroo, Superoo for 2014 -2015. My writing has been featured on Scary Mommy. Locally I have worked with Tomasello Winery, Tuckerton Seaport, Sahara Sams and Diggerland. I look forward to the opportunity to work with your brand.